So, If Businesses and Corporations Don&#8217;t Create Jobs, Who or What Does? So, If Businesses and Corporations Don’t Create Jobs, Who or What Does? On any number of interpretations, that’s a remarkably counter-intuitive claim to make. 3. Never alone or in concert with others or other things contribute in any way to the conceiving-as-creation of even a single job. On these interpretations, Microsoft, Exxon, Apple and the rest of the Fortune 500, the pub down the street, your local supermarket, your neighborhood florist shop, the medical clinic that treats you, the law firm or dentistry services you use and the farms of America never create jobs, not one—not even indirectly, e.g., by creating demand for the products and services of their suppliers, not to mention directly by hiring employees. Corporations Are Just Like Recruiters? These claims make businesses and corporations sound like recruiters, whose job it is to fill jobs, not create them. The claims also seem to suggest that, even in the case of the corporate jobs posted by recruiters, a job is not created until it has been filled. Hence, and despite the foregoing opposite suggestion, when a business uses a recruiter to fill a job, the recruiter is, prima facie, a co-creator of the job—which demonstrates the obvious: that in some sense and instances, the Bs and Cs (businesses and corporations) do not create those jobs by themselves, i.e., without help, yet nonetheless play a critical role in creating and filling them. Analogously, in connection with general creativity, University of Chicago professor and Flow theorist Mihaly Csikszentmihalyi has argued that an idea is not creative until somebody applies it, i.e., is not proved to be creative until it has made a practical, cultural, political, psychological, etc., impact as a meme on someone or something other than its creator (thereby entitling that someone or something to stake a claim as a co-creator?). It would be perfectly correct to say, “Businesses and corporations do not create jobs without cooperation, contractual agreement and/or contributions from others and other things”, e.g., the case of a farm hiring fruit pickers, but only if the weather has cooperated by providing sufficient rainfall for the crops to grow and only if seed suppliers delivered as promised. The Clinton perspective resonates with President Obama’s oft-cited assertion addressed to businesses: “You didn’t build that.”—which, on it’s most reasonable interpretation and in context means, “You didn’t completely independently build that, as if you operated in a vacuum or pulled yourself up by your bootstraps alone.” (i.e., the existence of your business depends on the existence of supporting infrastructure, enabling—as opposed to obstructive—regulatory policy, the willingness of people to work for you, etc.). However, it does not mean that you didn’t create the core ideas and mission for your business, legally register it, develop the business plan, secure the capital (as land, cash, labor, equipment), undertake marketing (with or without help), arrange the financing, and accept the risks and liabilities of doing so. Businesses and corporations are neither necessary nor sufficient for job creation; therefore they are causally irrelevant to job creation. …Bs and Cs play no causal role in the creation of jobs—of any job. 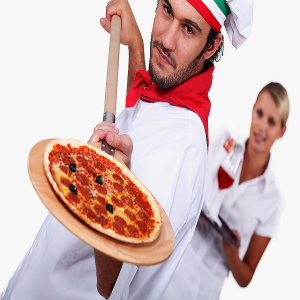 Pizza chefs are neither necessary nor sufficient for creating a pizza; therefore, pizza chefs never (have) create(d) any pizzas.